Champions Group & BREN in association with Decathlon Sarjapur proudly announce the success of a great cause in the form of the GO GREEN RUN marathon held on Saturday, 26th July. Environment-conscious citizens of Bengaluru came out early and energetically to run for a greener Bengaluru and better health. 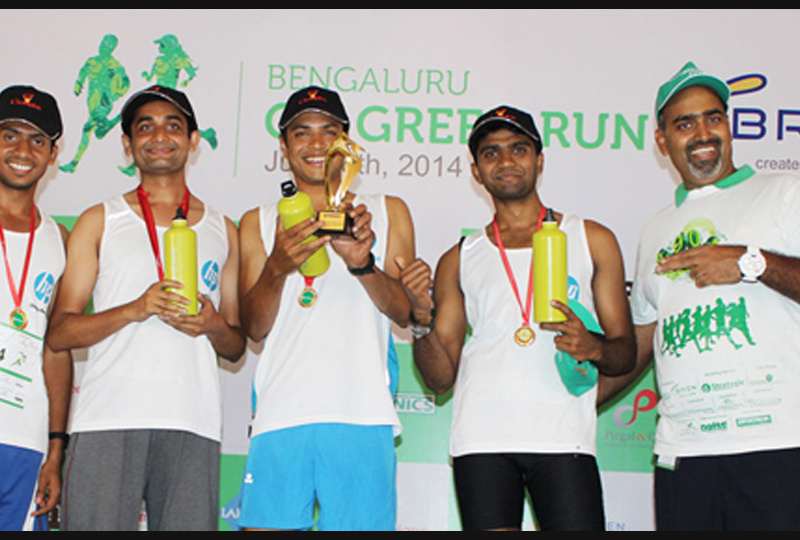 Over 450+ nature-loving Bangaloreans ran for this cause as they have done even for the prior marathon events that Champions Group had held in the city. Mr. Subhakar Rao, CEO & Chief Mentor of Champions Group, flagged off the first 10K run felicitously. The Champions Citizen Award was given to Dr. Nagendra Swamy, Director of Manipal Hospitals, for being the special guest for the event. Participants from reputable corporate firms such as HP, Tavant technologies, etc., graced the marathon with exceeding enthusiasm. The 10K run winner was David Kiptoo Kiprotich from Kenya. Special mention this time should be made of the involvement of the children who ran the 2k run. Separate runs for women were held along with Corporate Relay Team of four members each for both men and women. A fun dance programme held later was followed by refreshments provided to everybody. ETV networks carried out the press coverage of the entire event. The other sponsors for this event comprised: Marketing Sponsor — Strategic Marketing Services; Data Partner — Span Outsourcing Pvt Ltd; VoIP Partner — IP Momentum; Venue Partner – Decathlon; Health Partner – Manipal Hospital; Cloud Partner – Cirrologix; Clothes & Apparel Partner – Aaboli; and Kitchen Appliance Partner – Nolte Home Studio. On the whole, it was one of the most gratifying and successful marathons sponsored by Champions Group. With a background that stretches back four decades, the Bren (the erstwhile SJR Group) Corporation has been developing infrastructure that drives progress and economic growth: roads, flyovers, highways, airport tarmacs, factories, and other public systems. Today, we have built some of the most prominent work, living and retail properties in the heart of Bangalore. In a crowded market of developers, we are defined by our exceptional customer service, which answers all your concerns, putting your needs on priority and your mind at rest.